I actually kind of like this shirt. It is finely striped greys. It does up with buttons. It sometimes looks purple. In Jump The Shark (4x19), Sam wears it from when they meet Adam at the diner, until before he takes Adam shooting. (The shirt looks VERY grey in this episode, but that’s just the Supernatural colour filter). In Two and a Half Men (6x02), Sam is wearing it when Dean joins him on the hunt the morning after Sam finds the baby. He wears it until the end of the episode. 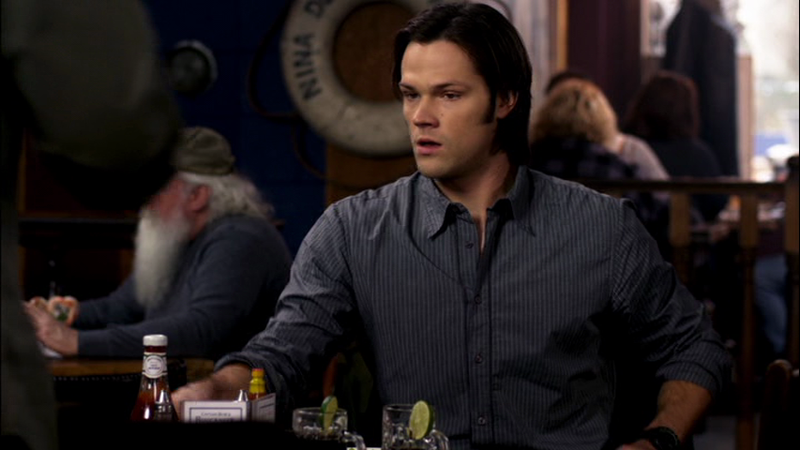 In Unforgiven (6x13), Sam wears it when they arrive in Bristol and he and Dean go to the restaurant. He keeps it on until he convinces Dean that they should stay in town and work the case – then he puts on a suit. In What’s Up, Tiger Mommy (8x02), Sam wears this shirt when they go to the auction. In Rock and a Hard Place (9x08), Sam wears this shirt at the end of the episode, as the boys say goodbye to Sheriff Mills and Sam worries about his own health. 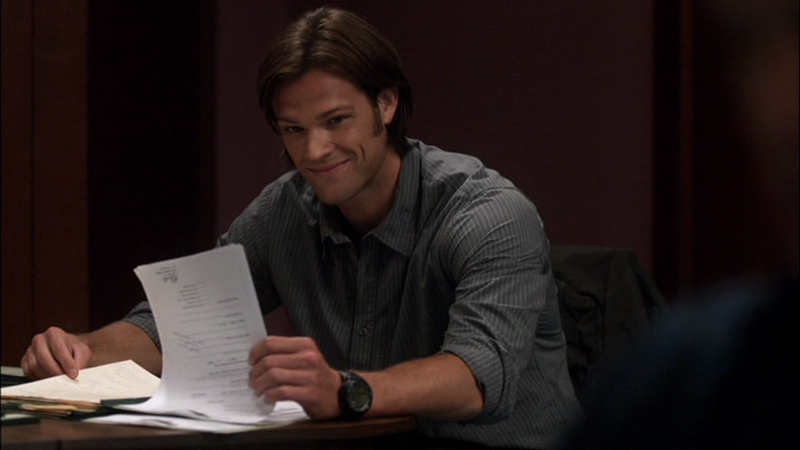 In Hibbing 911 (10x08), Sam is wearing this shirt when Jody calls him while he’s at home in the Bunker. In Halt & Catch Fire (10x13), Sam wears this shirt at the end of the episode when he and Dean drop Delilah off at the widow’s house so that she can make amends.